I don't know what you guys call it, but around here it's a MHD (see title post) and I was waaaay overdue! I was gonna be all good and do some house stuff, sorting cupboards etc...but nah I sewed YAY!!! Tutorial is here and here's a quick pic side by side to get an idea of how they'll all look together...super happy and fizzy! Love Cypress Paisley in Lime and Soul Blossoms Peacock Feathers in Blush....love the feathers so super glad I bought extra....not so happy that I found that I already had a WHOLE yard of the Paisley already in my ridiculously untidy stash.....crap! Arrived, cut and posted off all in the same day.So I treated myself to a new project..
Must buy more Chicopee...it goes with everything! What a great day you had - your mental health must be well improved I am guessing! Good on you - being so productive and creative is always so refreshing for the soul! And your projects look great, well done! Those bee blocks are so fun! Love the tumbler quilt too. Ah, MHD I remember those - wanted more than I had always. Love the wedge quilt! Impressive productive day :) Those bee blocks look so much fun and love love love the tumblers! Also, I love the color combination in your tumbler quilt. SQUEEEE!!!! I love the bee blocks! Can't wait to get that happy package in the mail. Your tumbler quilt is beautiful. Love the colors. I have Diana's blocks as the first on my to-do list. 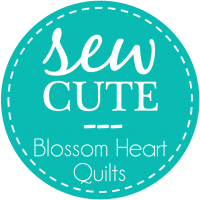 It will be the first time I turn my sewing machine on in a month so I am happy to hear they are EASY! Love the tumblers and can see them on the blue sofa. I love the bee blocks for Diana. She is one lucky lady to receive them. Friday Finishes - About Bloody Time!